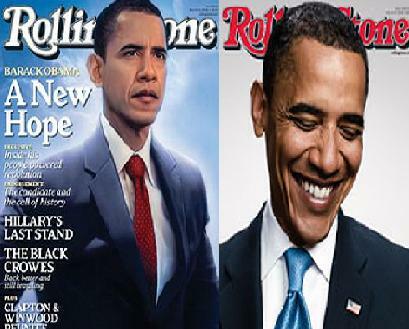 Presidential candidate Barack Obama has appeared in the cover of the iconic magazine Rolling Stone is an honor most celebrities hope to achieve just once in their career. The Illinois senator appears on the front of the latest issue of the American pop culture bible, which unusually bears no headline. The latest issue depicts the Democratic presidential hopeful with his eyes closed and a happy smile on his face. The Democratic nominee also unveiled an eclectic taste in music when running the magazine through the playlist on his MP3 player. Rapper Jay Z, singer Cheryl Crow and Elton John, plus jazz greats like Miles Davis, are all among artists he listens to while on the campaign trail. He also told the mag he is thrilled to have received the support of musicians such as Bob Dylan and Bruce Springsteen. There has been no reported groundswell of support among Latino stars for Republican nominee John McCain. But just because voters like a group’s music doesn’t mean they will follow their political recommendations, analysts say. The independents are not going to be swayed by videos chanting Obama. They’re going to be swayed by the issues, said Tico Perez, an Orlando political commentator.